The ending you receive after you beat Lavos depends upon what point in the game you are at, or what the save file reads when you save your game. If you challenge Lavos after Crono's death and the black omen's rising, the ending will depend upon three factors: whether or not you saved Crono, whether or not you spared Magus, and whether or not you lost the Epoch by ramming it into Lavos, thus allowing for eight variations total. A couple "mini-endings" can also be seen by losing to Lavos in a normal fight with him or losing to Magus. At the millennial fair, press on the right Telepod in a New Game +, where you see the sparkle. This is necessary if you want the Programmer's Ending at the start of the game or the Frog Ending. It's also the easiest way to obtain most of the endings since you will skip directly to Lavos's first form. At the end of time, go into the bucket to travel to the day of Lavos in 1999 A.D. and tell your party you're ready to fight Lavos. This isn't strictly necessary for any of the endings, and you will have to battle through all of Lavos's "pre-forms" before you fight his first body. A time gate will appear to take you back to the end of time after you beat the outer shell. When the Epoch is able to fly, take it to 1999 A.D. and choose to ram it into Lavos. You'll destroy his first form and skip directly past the outer shell. This is necessary for any of the main variations without the Epoch. Fight your way through the Black Omen and fight Lavos's outer shell after defeating Zeal. You will find a time gate on the inside which will take you back to the end of time in case you want to do some more questing. Fighting through the Black Omen is necessary to activate the New Game +. You will also have to fight through all of Lavos's forms with this method. The one other fight with Lavos you can get into is the one you're expected to lose, when Zeal commands Lavos to attack you when you reach the end of the Ocean Palace and before Crono dies. Lavos will be much stronger than normal and unless you're in a New Game + you'll likely have no protection against chaos or other status ailments. After you defeat the first form however, the rest of the battles proceed as usual. For information on fighting Lavos, see Lavos' phases. In general it's best to wait until the New Game + to try for the endings so you can have some of the best equipment in the game, it would require an incredible amount of leveling up without it. The best way to challenge Lavos to get one of the endings is normally through the right gate at the millennial fair. If you're going to be going through a game of Chrono Trigger and trying to pick up as many endings as possible, one thing you can do as soon as you reach the End of Time is take the bucket to battle through all of Lavos's outer forms, and once you go inside the shell a time gate will send you back to the End of Time where your game can proceed as usual. This means that you'll only have to battle through Lavos's outer forms once for all the endings you want to get in your save file, since you can just resume your fight after the outer shell by going to the End of Time. Note that Lavos's outer form being gone holds whether you challenge Lavos at the Black Omen, End of Time, or right telepod at the fair, but you can still crash the Epoch into Lavos and fight the battle at the Ocean Palace you're meant to lose. You'll see some variation of this ending if you choose to fight Lavos after you complete the Zeal quest and have the magic kingdom crash into the ground, and if you save Crono as well. This also allows you a chance to do all the side quests to get some equipment up to the challenge of fighting Lavos. The ending you get will depend upon two main factors: whether or not you spared Magus, and whether or not you rammed the Epoch into Lavos in 1999 A.D. If you spared Magus, he'll appear. If not, you may get to see Frog in human form. Depending on how many cats Crono owned (you can get more by winning a cat and giving your cat some cat food), that number will run through the time portal (in the variation where you didn't crash the epoch into Lavos). If you saved Lucca's mother Lara, she will be standing up in good health during the final scenes when you walk around the fairgrounds. If you saved the chancellor, he'll show up in the throne room instead of Pierre. If you didn't have the conversation with Robo about the "entity" after the Sunken Desert, Marle will mention she's convinced that some greater force wanted your party to experience these events. If you have, she'll mention the conversation. In all these variations, Crono will wake up to find out his stay of execution has been canceled. He'll visit the castle to learn that Lucca did a little temporal tampering to bring her ancestors and descendants to the castle to show the king all they've accomplished. Crono will be thanked as a hero, and Crono and Marle will get to wander around the Millennial Fair during the Moonlight Parade together in the evening. After doing a lap around the track, head to Lucca's time machine and you'll say goodbye to each member of your party, including Magus of course, and you'll decide that the entity you talked about must be at peace as well. The twist to this variation of the ending is that Crono's cat(s) will run away because he hasn't been feeding them (no way to avoid this, although you can have up to 15 cats if you do feed them and win another at the fair), and Crono's Mom will run in the portal after them and disappear. After saying goodbye to the king, you'll spend the ending soaring around in the Epoch, viewing some scenes from each time period you visited. Similar to the above ending, only instead of Crono's Cats running away, Marle and Crono will fly off on a bunch of balloons over Truce as the credits roll. Similar to the main ending with the Epoch, only when you're flying with the Epoch you'll see a brief scene with Frog at a waterfall changing form, and you'll see the scene in 600 A.D. where Frog is walking across the bridge with Leene and the soldiers, and he'll be in human form. Identical to the variation with Magus, only Magus won't appear. You won't get to see Frog in human form. These last two endings are the ones most players are likely to see, depending upon whether they completed the final quest to rescue Crono or not. This is the ending you get if you defeat Lavos after completing the Zeal quest and while Crono is still "dead." This ending and the main ending however, take place largely at the fair and has a lot of variations depending upon some of the last quests you did. If you spared Magus, he'll appear. If not, Frog may be in human form. If you didn't have the conversation with Robo about the "entity" after the Sunken Desert, Marle will mention she's convinced some greater force wanted your party to experience these events. The main focus of the ending is Marle going through the fair without Crono, and the rest of the gang coming up with a way to get him back by going to Death Peak. You'll wake up at the End of Time with Marle and Lucca in your party. Gaspar will tell you that the time gates are closing, and that you'll need to leave quickly. Try talking to everyone, and they'll insist they have to leave, and they'll each head back to their own time periods, with Magus going to 12,000 B.C. oddly enough. You'll show up at the Millennial Fair again, talk with Lucca as usual, then the whole party will show up and chase Gaspar into a time portal if you didn't already have the egg. You'll decide to search for Crono with the Epoch, and Marle will leave her dad hanging while he's trying to place the bell. The last scene will be Crono running out of the mists of Death Peak to meet Marle. You'll wake up at the End of Time with Marle and Lucca in your party. Gaspar will tell you that the time gates are closing, and that you'll need to leave quickly. Try talking to everyone, and they'll insist they have to leave, and they'll each head back to their own time periods, with Magus going to 12,000 B.C. oddly enough. You'll show up at the Millennial Fair again, where your party members will mysteriously show up, and Lucca will inform you that she's turned the Telepod into a time machine. If you don't have the Time Egg she'll transport Gaspar to your time to give it to you. Your whole party will head off to rescue Crono, while Marle stays behind and helps the king with Nadia's bell. She'll float up on the balloons and end up at Death Peak, where Crono runs to meet her out of the mist. Similar to the variation with Magus, if you don't have the Time Egg, your party will pop out of the gate and start chasing Gaspar at the End of Time. You may not recognize one of your party members however, since Frog will be in human form with the Masamune strapped to his back and with long green hair, Lucca will comment on how handsome he is, and the ending will proceed as usual with Marle waiting on Death Peak. This ending will be basically the same as the variation with Magus only Magus won't be included. You won't get to see Frog in human form. There are actually two ways to get this ending, which are the two toughest ways to fight Lavos. You can either beat him at the first Ocean Palace fight before Crono dies, in which you're expected to lose, or you can challenge him at the very beginning of the game. If you choose the Ocean Palace route, you can have any characters in your party but Magus, just make sure you have your best equipment since the first fight will be harder than usual. The later fights are the same as normal. If you choose to fight Lavos at the beginning of the game, you can do it with or without Marle depending upon whether you enter the right Telepod right away or whether you try out the Telepod first and do it with Crono alone. You can fight Lavos with Crono alone if you want, but there's no real reason not to take Marle, so you might as well. Hopefully you're at a high enough level where this is a piece of cake. You'll get to talk to the programmers in the coolest exposition of a credit sequence ever, then be treated to a rapid fire scroll of the credits to complement your breezing through the game. Challenge Lavos using the Telepod as soon as you come back from 600 A.D. for the first time. You'll only have Marle and Crono in your party, so make the best of it. You'll pop out of the Telepod again only to find out you changed history in a bit of a froggy way. With this ending, you will see Crono, Marle and Lucca go to the castle. The king and his daughter will hop like frogs. A peaceful way to end. Use the bucket at the end of time when you first get there, or at any point before returning to 600 A.D. for the second time, the gate at the fairgrounds works as well if you use it before you head to the past. A Nu, a frog, and eventually a Kilwala will cavort on screen while the credits roll. All things begin and end with Nu, don't they? Beat the game during your second trip to 600 A.D., while everyone still thinks Tata is the hero, but before he learns he's a fake in the Denadaro mountains. After a few scenes with Robo in the future, Tata will challenge Magus's castle and find some unusual company. Beat Lavos after you get the hero medal and before visiting 65M B.C. for the first time to get the dreamstone. You'll see a bunch of scenes showing the villagers in 65M B.C. to show what you missed out on, and a few other random things with the characters. Beat Lavos after you return from your first trip to 65M B.C. with the gate key, before giving the Masamune to Frog. 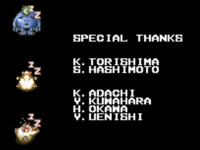 This ending is probably the worst out of the bunch, it just shows a few sprites in between showing the credits. Beat Lavos after giving the mended Masamune to Frog, but before confronting Magus. You'll start out at Lucca's house with her fixing Robo, and Frog will go to Magus's castle to take care of some unfinished business. He'll go through each of Magus's henchmen in turn, with a final battle with Magus taking place over the credits. And the winner? Open for interpretation. Forward to the Past or Unnatural Selection? Beat Lavos after you defeat Magus, but before you go with Ayla to fight the Reptites. The past will have been changed so that the Reptites won the battle with the humans, so all of the characters are Reptites, except for the Green Ambler, who is a human. After facing Azala, but before Schala opens the sealed door. The Magic Kingdom, Break the Seal!, The Guru on Mt. Woe, What Lies Beyond? or Lavos Beckons. Basically any point after you reach 12,000 B.C. until the battle with Lavos you’re meant to lose, with one exception: Beat Lavos after reaching 12,000 B.C., before Zeal crashes down to earth. A few scenes will take place involving Magus disguised as the prophet, implying that he would get his chance to do what he wanted in 12,000 B.C. without your interference. Save file when you challenge Lavos should read: The Magic Kingdom and Schala should have just opened up the door to the Zeal Palace, but Marle hasn't powered up her necklace. Better known as the ending which proves Crono isn't a mute. That's right folks, he talks. Beat Lavos after Schala opens up the door to the Ocean Palace but before charging up your own pendant. Marle and Lucca will put on a slideshow and discuss the men of Chrono Trigger. DS ONLY This is the only DS exclusive ending. You have to beat the Dream Devourer. Once you beat it, it will hit you with some sort of beam attack, and then the Dream Devourer will be ready to take down existence when Future Magus manages to wake up Schala, who warps your party back to its own time. Schala will give a speech about how she's changed and sends Future Magus back to whence he came. Magus will wake up, and decide to recover from his amnesia. Once the credits are over, you'll see a new cutscene and obtain the Dreamseeker, Crono's most powerful weapon! A few of us might be unlucky enough to see this one. Simply challenge Lavos at any point and die against him. You'll see a more detailed version of what happened in 1999 A.D., and you'll see the grim line "But... 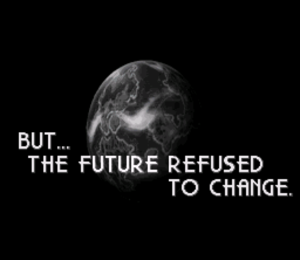 The future refused to change" (In the DS version it says "In the end, the future refused to change.") at the end. If you lose to Magus in the battle against him in his castle, he will turn around and raise his arms, and you will begin to hear Lavos make his trademark "scream". It can probably be inferred from this, and from comments that Magus makes later in the game, that Magus was in the process of summoning Lavos to his castle where he failed at defeating him. Another side note, these two battles are the only known ones that trigger special endings, although you can also lose the first battle against the Golem which will similarly lead to you getting trapped by Zeal. This page was last edited on 23 December 2018, at 22:37. This page has been accessed 183,756 times.